This traditional home located in an east Louisville suburban neighborhood suffered from a lack of character with its smallish kitchen, choppy floor plan, and several isolated, uninviting living spaces. The owners were most interested in a kitchen that would support their “foodie” cooking experiences, open areas for entertaining and family interaction, and a strong connection to their lovely garden and outdoor space. With the help of architect Mary Herd Jackson and builder Doug Amlung of Amlung Construction, the home was transformed from a spec-grade house into a high-end custom residence with thoughtful design including some interior renovation and a modest 240 square foot addition. 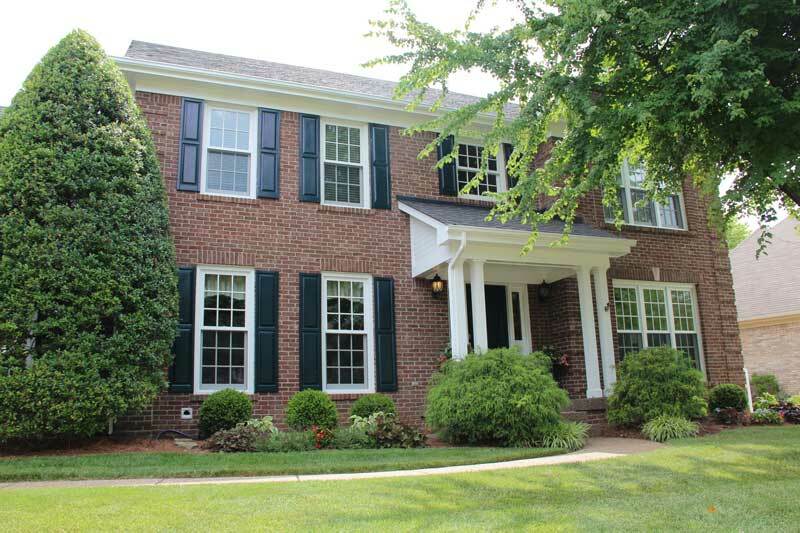 New Marvin windows and doors were supplied by Door Store and Windows. The kitchen was gutted, rearranged and enlarged to improve function, circulation and aesthetics while updating the appliances to “aspiring chef” level. 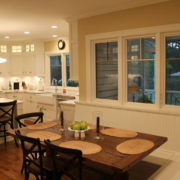 Marvin Casement Windows with a “two over one” design light a built-in banquette and breakfast table. 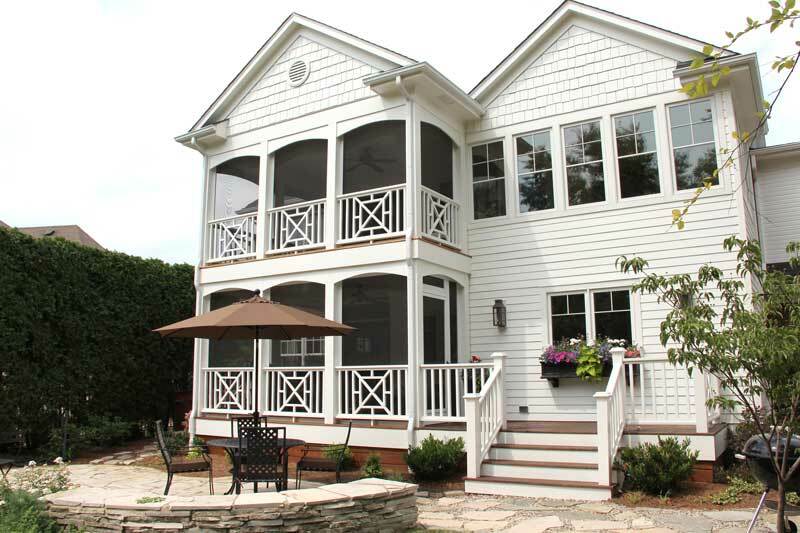 A two-story screened porch blends interior and exterior spaces and transforms a rather bland rear elevation through the addition of new gable rooflines, Chippendale railing and eyebrow screen tops. In addition, most suburban homes do not have windows on the sides of the house, so adding two windows in the family room (one on each side of the fireplace) was a significant improvement. 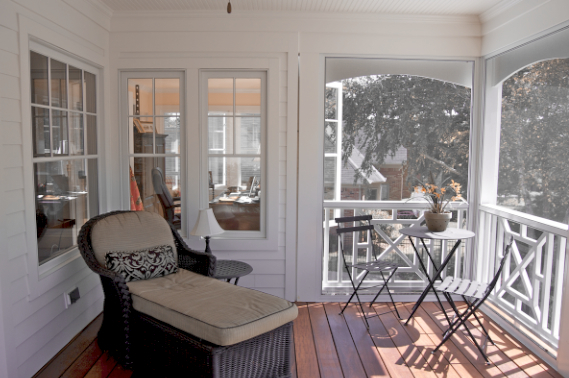 The lower screened porch is accessed through a Marvin French inswing double door. 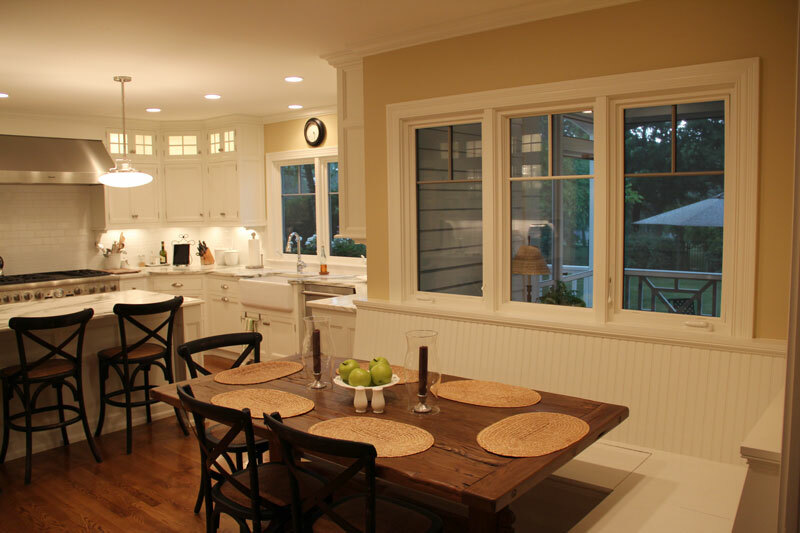 Two Marvin double-hung windows bring natural light into the family and front rooms. 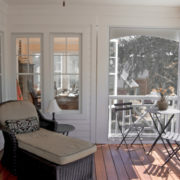 The lower screened porch connects beautifully to an outdoor stone patio and sitting area for an inviting indoor/outdoor experience. 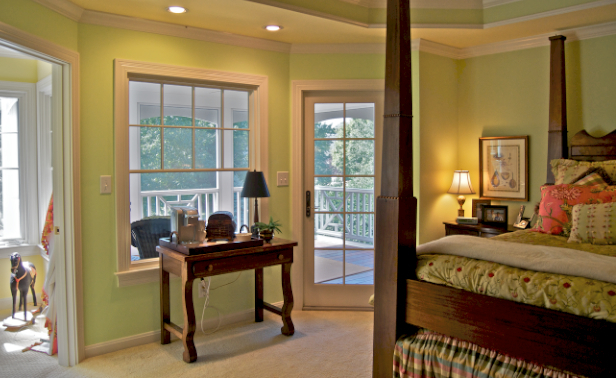 The upper screened porch brings light and a comfortable retreat to the master bedroom. 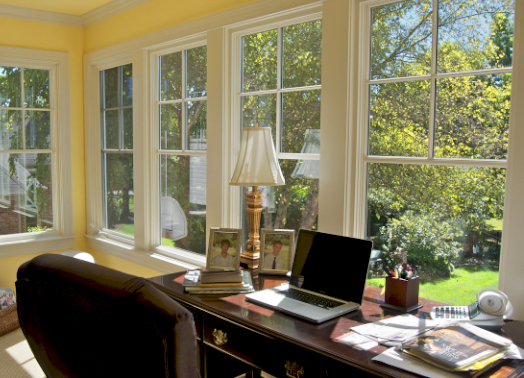 An office added off the master bedroom with five “four over one” Marvin Casement Windows offers stunning views of the garden area. 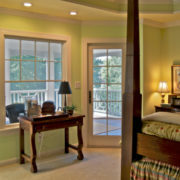 Window styles were selected to maximize views with more windows added to the rear overlooking the outdoor space. 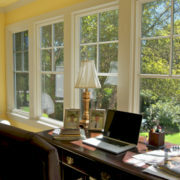 Casement windows feature muntin placement that mimics a double-hung appearance when closed, yet crank out to catch the breeze. Lower sash muntins were eliminated to enhance the view while adding style to the exterior facade. The homeowners are delighted with the transformation of their home. All of their goals were met in a thoughtful way that maximized existing space and incorporated a minimal new addition. They were especially happy that the project addition didn’t reduce their backyard space but actually enhanced their outdoor entertaining and garden area. The Door Store and Windows was a great partner in this project. I always advise my clients to invest in high quality windows because to see them, touch them and operate them is to experience fine engineering on a daily basis.